I was standing on the concourse of the newly-opened St Pancras station when I was overcome with a very rare emotion: delight on reading a Government policy document. Having attended a couple of the advisory meetings which led to the Ecotowns Transport Worksheet, I was expecting to read a watered down version of the earlier drafts, instead of which, I was looking at one of the most radical statements on transport ever to emerge from a British Government source. Carfree areas, following the definition of Carfree UK, the organisation I represented, were to make up “a substantial proportion” of every eco-town. They would follow the examples of European cities like Freiburg and Groningen in restraining motor traffic and giving the advantage to cyclists and pedestrians. For once, it seemed, we would learn from our neighbours and avoid the mistakes of our own past. My elation was short-lived. A few days later, when we saw the shortlist of possible eco-town locations, I was left wondering what it is in our national character which gives us this talent for taking a great idea and ‘stuffing up’ its implementation. Carfree areas and carfree living are central to the transport guidance for the eco-towns, for very good reasons. Although the relationship is not a simple one, car ownership exerts a powerful influence on car use. Previous attempts at ‘sustainable new settlements’ in this country have spectacularly failed in this respect. There have now been two studies of Poundbury, Prince Charles’ model new community on the edge of Dorchester, for example. The most recent one revealed 94% of households owning a car (UK average 75%); three quarters of journeys to work are made by car (average for England 55%). In Cambourne in Cambridgeshire, described as a ‘proto eco-town’, 95% of households own a car; 81% drive to work despite a range of features designed to encourage more sustainable transport. The equivalent figure for Vauban, the eco district on the edge of Freiburg, is 14%. Although it is served by an excellent tram system, cycling is the main mode of transport there. Small towns linked to but separated from larger conurbations tend to suffer from car dependency. This is true, not only in this country, but also in city regions like Metropolitan Stockholm where good rail links have helped to reduce the proportion of journeys made by car from the central areas of satellite towns, but the advantage is undermined by increased journey distances. We received no response to our paper, and the shortlist confirmed our worst fears. In two cases a specific location has not been identified. Of the other 13 only one, Pennbury near Leicester, could conceivably fulfil the ‘integrated town’ criteria (and there are other problems surrounding that scheme). In the other 12, the ‘parent’ conurbations were either too distant, too small or both. None of them seems designed or located to grow towards self-sufficiency. Railway lines were distant from some of the sites and peripheral to others. Since then, some of the proposers have presented plans to build new rail or light rail extensions, but even if they can fund the capital costs, viable services in some of these remote locations, would require ongoing subsidies which neither they, nor the Government are offering. The physical shape of most of the proposals owes more to land ownership and politics than any serious attempt at sustainable design. Worst of all, some are being promoted as means of funding major road building schemes. The shortlisted areas are shown as green blobs in the consultation paper, Ecotowns a Greener Future. The more specific developers’ proposals which led to them are illustrated on cpre.org.uk. Take a look at a few of them and ask yourself: would you be happy living there without a car? In On the Wrong Line, Christian Woolmar traces the problems of the British rail network back to its earliest days, where, unlike many European countries, private promoters were allowed to acquire land and build new lines in an uncoordinated way. History, it seems, is in danger of repeating itself with the eco-towns programme. The selection process failed to produce a shortlist of sustainable locations because it turned the planning system, the ‘wrong way round’. Instead of asking: ‘where are the best places to build?’ the Government invited bids from developers, landowners, local authorities, anyone with a piece of land they wanted to develop. A programme like this has never run before, so why would existing landholdings reflect the most sustainable locations to build eco-towns? A consultation on the proposals has just closed. There is to be a sustainability appraisal, able to compare the proposals with other locations not on the shortlist. This offers a glimmer of hope that the programme can still be rescued from failure in its own terms, providing the Government is willing to disappoint the expectations it has raised amongst promoters of unsustainable sites. A few weeks ago, six environmental groups wrote an open letter to Housing Minister Caroline Flint, asking the Government to reconsider the shortlist, and alternatives to it. They are not alone. A wide range of individual experts and organisations from the Centre for Cities to the Local Government Association have made similar points. Will the Government listen, or will it follow the examples of every policy disaster from rail privatisation to the war in Iraq, and press on regardless? The downturn in the housing market offers an opportunity. There is now more time, to begin the search, which should have been done in the first place, for genuinely sustainable locations, for integrated eco-towns, for eco quarters in existing cities, and if necessary, a site for a larger more self-sufficient eco-town or eco-city. 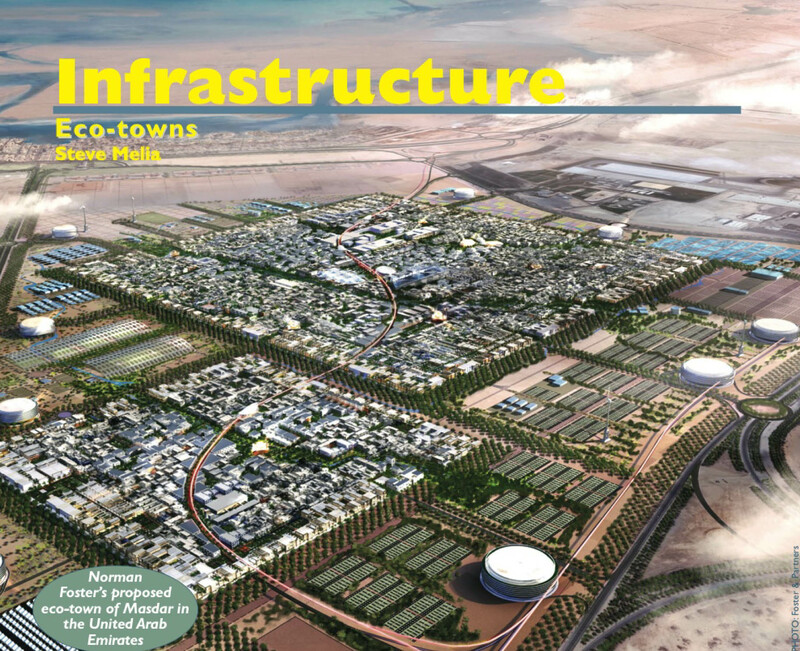 British companies have helped to design the world’s first zero-carbon, entirely carfree new city: Masdar in the United Arab Emirates. If this country has the skills and the vision to develop something of this nature overseas, why not here, in Britain?